Definition: A category of angle modulation in which the frequency of the carrier wave is changed according to the amplitude of the message signal is known as frequency modulation. It is abbreviated as FM and is a widely used analog modulation technique. One can modulate a signal by varying the amplitude of the carrier signal according to the message signal, which we commonly knew as amplitude modulation (AM). The implementation of AM is simple. However, it possesses various disadvantages. Evolution of FM has overcome the disadvantages associated with AM. Thus, is enormously used. As we know, that both the amplitude and phase of the carrier wave remains unchanged and only the change in frequency is noticed in case of frequency modulation. Hence, we can say information is transmitted by the frequency variation in the case of FM. 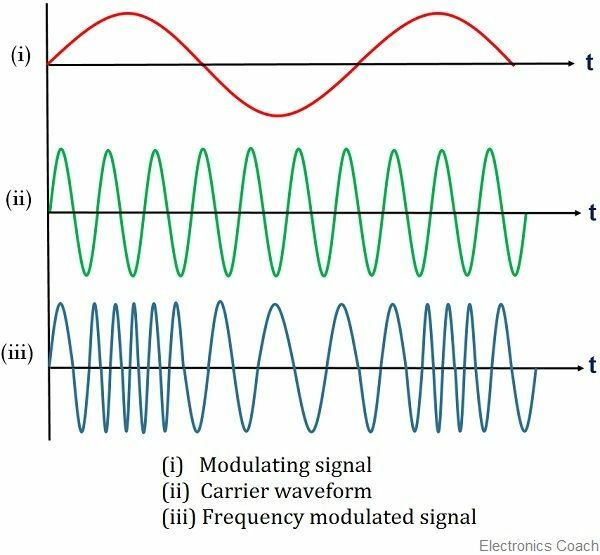 Let us now move further and have a look at how a carrier wave undergoes frequency modulation. The first image in the above figure shows the modulating signal that has to be transmitted from an end to other. The second one is the carrier wave; whose frequency is to be varied according to the amplitude of the message signal. The next image shows the frequency modulated signal that is transmitted after modulation is done. Here as we can see, that initially when the amplitude of the modulating signal is minimum during its positive half cycle, then the frequency of the modulated signal is somewhat similar to the carrier wave. However, with the increase in the amplitude of the message signal the frequency of the carrier wave starts varying. When the amplitude of the modulating signal is maximum, an increase in the frequency of the carrier wave is noticed. Hence, more number of cycles occurs in that particular time interval. Similarly, as the amplitude of the message signal starts decreasing, a corresponding decrement in the frequency of the carrier wave is also noticed. Thus, we can conclude that, with the increase in the amplitude of the message signal, a corresponding increment in the frequency of the carrier wave is observed. Likewise, the decrease in the amplitude of the modulating signal will lead to the decrease in the frequency also. It is noteworthy that in FM, the frequency changes according to the modulating voltage. Here, Δf denotes the frequency deviation. The extent of the occurred change in frequency of the carrier wave is termed as the deviation. It is noteworthy that this deviation is made according to the voltage of the modulating signal and does not depend on the modulating frequency, which can be easily understood by the expression of frequency deviation. When the frequency deviation is constant, then due to inverse relation, with the increase in modulating frequency, modulation index will decrease. It is the major factor in frequency modulation because the transmission bandwidth is decided by the modulation index. FM supports the modulation index to be greater than 1. The degree of modulation in frequency modulation is determined by the extent of the deviation. It is basically defined as the ratio of actual deviation in frequency to the maximum value of deviation allowed. A frequency modulated wave shows resilience (flexibility) property towards noise and interference factor. Thus, is utilized in the high-quality broadcast. The effect of noise that is dominant in amplitude modulation, is not severe in case of frequency modulation. As during long-distance transmission, the high-frequency signal passes through the ionospheric layer of atmosphere and does not get reflected. Thus, is used for short distance transmission. FM signal transmission and reception are somewhat more complex as compared to AM. Frequency modulation is expensive than that of Amplitude modulation. It is used in radio signal broadcasting. During satellite and microwave communication, frequency modulation is widely used. It has extensive applications in cellular radio communication and TV sound transmission. Whenever audio is heard on the speaker of a receiver, then the volume or intensity is determined by the shift in the frequency of the carrier wave.